The online textbook service Chegg today announced that it has acquired Imagine Easy Solutions for $42 million. 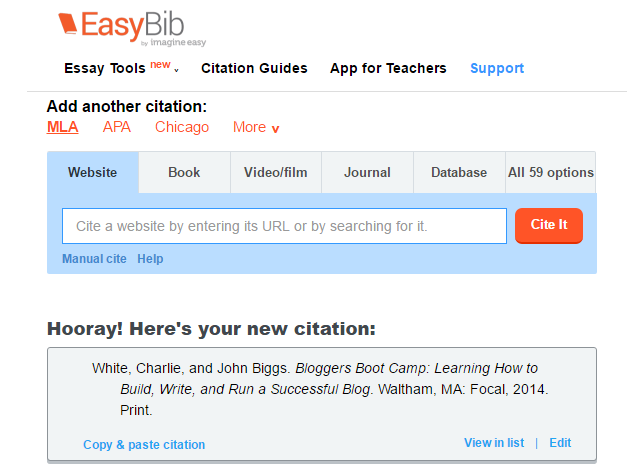 Imagine Easy is the company behind online bibliography and research tools like EasyBib (which was also its first product) and similar tools like Citation Machine, BibMe and Cite This For Me, most of which it acquired in the last couple of years. Imagine Easy also offers teaching tools for helping students develop reading and writing skills through its Imagine Easy Academy and Imagine Easy Scholar products. Chegg will pay $25 million up front and $17 million in deferred payments — with another $18 million of potential payments over the next three years that depend on whether the team meets its goals. In the last 12 months, Imagine Easy’s bibliography and research tools powered about 240 million sessions and EasyBib alone saw more than 7 million unique users in March 2016, Chegg tells me. In total, all of these services together have helped students from mangling more than 1.4 billion bibliography entries. Imagine Easy’s business model is based on a mix of subscription fees and revenue from online advertising on its sites. Chegg makes it easy to buy, rent and sell textbooks and e-textbooks online. But sooner or later, some pesky professor (or, these days, more likely a teaching assistant or adjunct), is going to ask you to do some research and write a paper based on what you’ve learned. To make matters worse, you’ll probably have to attach a bibliography, too. Thankfully, tools like EasyBib make that pretty easy these days, so you don’t really have to worry about the difference between Chicago-style, APA-style and MLA-style bibliographies anymore. While these tools are clearly Imagine Easy’s most visible services, Chegg today noted that the company’s tools for teaching writing skills are also an important reason for acquiring the service.